Kavanaugh Confirmed Amid Day Of Protests And More Than 150 Arrests In D.C.
Throngs of protesters vehemently oppose the Kavanaugh appointment to the Supreme Court. Judge Brett Kavanaugh was sworn-in as the latest Supreme Court justice Saturday, Oct. 6, even as acrimony over his nomination spilled onto the steps of the court building and around the U.S. Capitol throughout the day. Kavanaugh took the oath hours after the Senate approved his nomination 50-48, in a vote that fell largely along party lines and was frequently interrupted by shouts of protest from the visitors gallery. Fourteen people were arrested in the gallery before or during the vote, according to U.S. Capitol Police. And 150 were arrested earlier in the day after refusing to get up from the steps of the Capitol. Kavanaugh’s approval gives the court a conservative majority that’s likely to last for years. And Saturday’s protests capped several days of public protest against a nominee with deep connections in the region. Even as the hundreds of protesters move on from the steps of the court, many of them say they plan to carry their anger at the process, Kavanaugh, President Donald Trump and Senate Republicans with them to the ballot box in November. The president (in a Tweet), however, cast doubt on their strength. 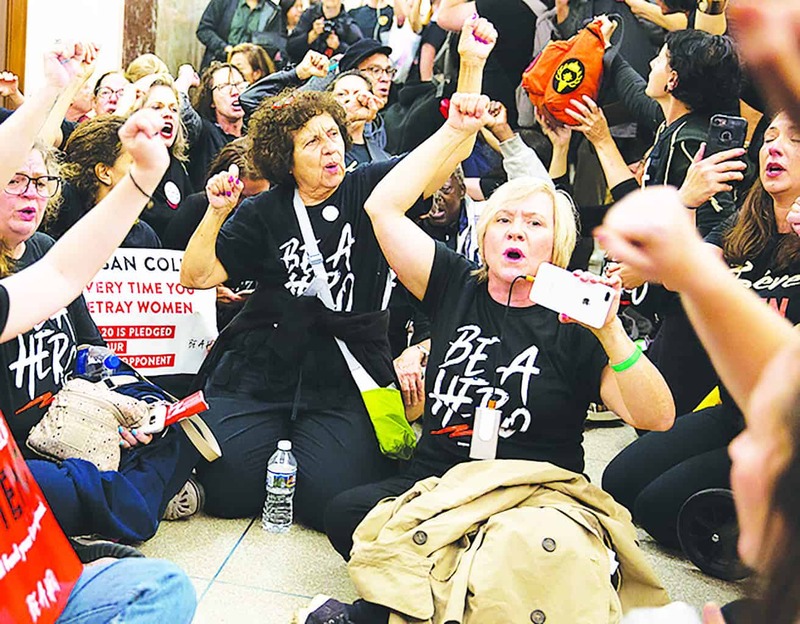 Throughout Saturday protesters carried signs and shouted slogans related to Kavanaugh’s alleged sexual misconduct, or referencing the testimony of Christine Blasey Ford, who had told the Senate Judiciary Committee the previous week that Kavanaugh had sexually assaulted her when they were students in separate elite private prep schools in the D.C. area. The protests had been building since Ford’s testimony in late September. A total of 101 people were arrested on Friday, Oct. 5, when the Senate was voting to end the debate period; 302 people were arrested the day before, during a “Cancel Kavanaugh” protest organized by the Women’s March; 59 people were arrested on the day of Ford’s testimony; and 212 people were arrested during Kavanaugh’s Senate nomination hearing. Without evidence, the president has accused many of the protesters of being “paid for” by billionaire George Soros. After Kavanaugh cleared a procedural vote Friday, his appointment seemed like a foregone conclusion. However, demonstrators took to the streets early Saturday for their final push. The Women’s March, which organized a number of previous anti-Kavanaugh protests, pledged to “flood the Capitol.” Protesters began showing up beginning at 9 a.m., some of whom participated in civil disobedience and self-defense trainings. As the vote grew closer Saturday, most of the protesters moved to the Supreme Court, where a rally was organized by nearly a dozen groups, including The United State of Women, NARAL, Lambda Legal, and Planned Parenthood Action. Organizers directed participants to wear black as a show of solidarity. A series of Democratic senators spoke largely about the upcoming election to the crowd, seemingly resigned to the outcome of the vote. At around 3 p.m., senators began filing into chambers for the final vote. Senate Minority Leader Chuck Schumer began speaking shortly before 3:30. He closed his speech with a call for Democratic voters to show up at the polls in November to challenge President Trump’s actions and agenda. “There’s one answer: Vote,” Schumer said. He called the process leading up to the vote a “low moment” for the country. His counterpart, Majority Leader Mitch McConnell spoke afterward, and called the contentious hearings a “brief, dark chapter” in the Senate’s history — one that could be closed after approving Kavanaugh. McConnell not only spoke in praise of the nominee, but in defense of the Senate itself. “This is an institution where the evidence and the facts matter,” McConnell said. The proceeding roll call vote began amid screams of protest from the Senate gallery. Vice President Pence — serving in his role as president of the body and on hand in case he needed to cast a tie-breaking vote — suspended the vote several times as protesters shouting “I do not consent,” “shame, shame, shame,” and other words of dissent were escorted out. Other protesters remained gathered outside of the Senate and the Supreme Court. Opponents to the vote are expected to keep up their calls for voters to hold their outrage through next month’s elections. Previous articleBrexit as an opportunity for Africa?